I made top 3 at Really Reasonable Ribbon for my father's day card and was a Poodle pick at the Poodles Parlour for the more masculinity card. While neither were a top prize this didn't stop me from being so excited I nearly wet myself. As I've only recently started to enter challenges it was a total thrill just to be recognised. While checking out all the wonderful winners at both Really Reasonable Ribbon and The Poodles Parlour I spyed that they are both running red, white and blue challenges. I thought that a new stamp I purchased at the Scrapbook and Papercraft Expo last weekend would be perfect for that colour scheme. 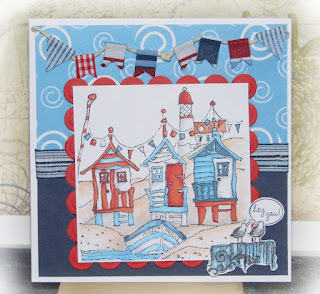 The cute beach huts is a Michael Powell design made by Urban Stamps. I coloured it with copics, however, I think next time I might try watercolour pencils or crayons as the detail makes is hard to keep the copics in the lines and blend (well it is for me anyway, lol). The die just peeking out behind the huts and the seagulls in the corner are also new purchases - the brand is Mpress. The little 'hey you' sentiment is hero arts I think!! The bunting at the top was cut from little bits of ribbon and stuck over some twine - definitely fiddley. Sorry but I have absolutely no idea what the papers are behind - they came out of my scrap drawers. This is lovely,thanks for joining us over at Sarah Hurley this week. Adorable design! I love your bunting! Thank you for playing in the RWB Challenge at RRR! Thanks for joining in at Misheflo's Monthly Challenge and Good Luck! This is so pretty! Fabulous layout. 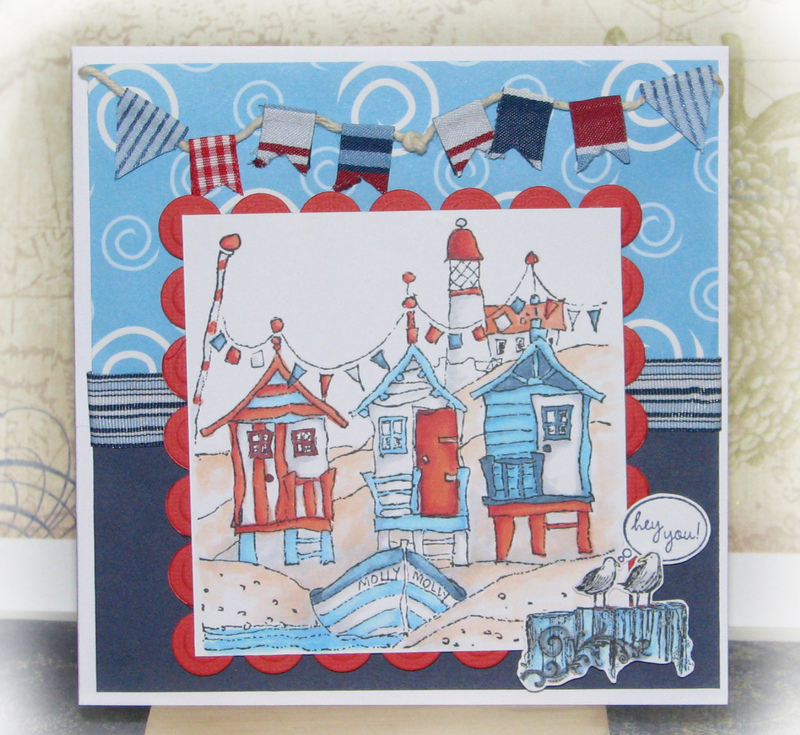 wow what a perfect seaside scene you have created and I just love the added bunting.Thanks for joining us this week at sarah hurley challenges.